Brand new for 2018 Zodiac's Open 7 takes things to a whole new level! Game changing performance, with jaw dropping stability that can only be described as revolutionary. The Zodiac Open 7 is a real looker and features professional grade replaceable Hypalon tubes, deep V hull, under deck storage, under console storage, removable aft seating, rod holders and more. 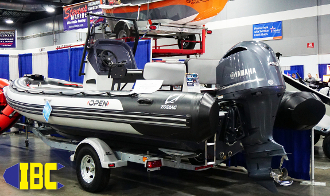 The "Open" designation means this Zodiac RIB is open water certified and designed to run hard and fast in conditions that would keep others at bay. Twenty three feet of fun powered by a Yamaha F250 with a capacity for 16 people means you can make a few friends on the way. Call (503) 235-2628 for more information.